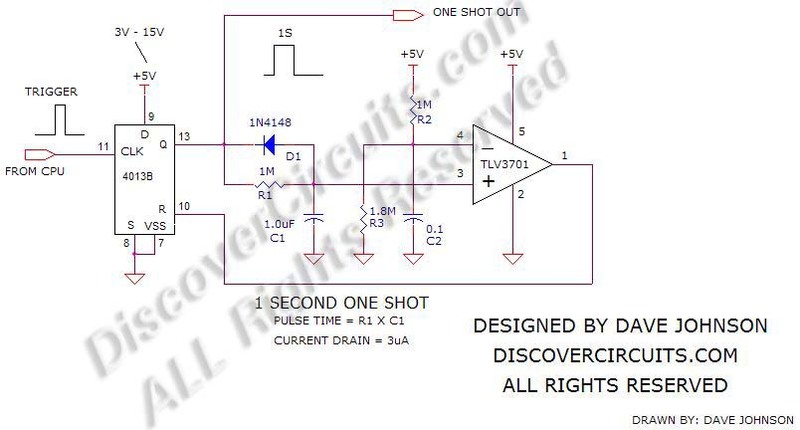 This timer circuit draws only 3ua of current, and can be powered by DC supplies ranging from 3v to 15v. The circuit produces accurate pulses whose time can easily be adjusted, based on the R1 x C1 time constant. The time should not change, even as the supply voltage varies. With the components shown, the circuit generates a one second pulse, triggered by a short positive pulse at the input. The circuit uses a CD4013 flip/flop and a TLV3701 voltage comparator. Unlike a classic 555 timer circuit, this circuit draws a hundred times less current.